Ramen noodles are my new foodie obsession. Ever since I had Ramen Tatsu-ya in Austin I've been on the hunt for the best ramen noodles around. Noodlecat serves up some yummy ramen that you customize to your liking. Noodlecat is from the same chef/owner of Greenhouse Tavern, Jonathan Swayer, a native Clevelander. They have two locations and I went to the one near E. 4th St. right in the heart of Downtown Cleveland. First of all, how cute are these bowls?! They get automatic brownie points for being creative on that front. I ordered the Pork Miso with Nama Ramen. Nama ramen is the traditional noodles you are likely most familiar with. They are yellow and curly with a chewy texture. They also have house ramen that is made fresh daily along with Ohio Udon which are also house made and are a little thicker. The soup was a pork miso broth and it was mixed with roasted pork, garlic, green onions and a "6 minute egg". You can order 5 other flavors that includes spicy and coconut curry. Although this ramen wasn't the same the ever famous ramen I've had in Austin, it was good ramen on a cold Fall day in Cleveland. The noodles were a good texture, soft but with a little bite to it. You really can't go wrong with the roasted pork in a pork broth. The flavors were fairly balanced, not too salty considering all the porky goodness. The sesame seeds added a some texture. And lets not forget the egg. Six minutes is arguably the ideal cook time to make the perfect soft boiled egg. They got it right because it added a that great eggy flavor every ramen should have. My friend also ordered the crispy brussels sprouts, which was a much larger size that either of us anticipated. It was served with cabbage and broccoli and tossed with kimchi and soy sauce. It was ample to share between the two of us and was a good bowl of veggies. I had to stay way from the kimchi part since I'm little spice averse. Even with that said I will always try something even if it might be spicy because I never know if it turns out not spicy at all. I doubt that will ever happen with kimchi, but it wouldn't be adventure if I didn't try. One of the best things at Noodlecat was this steam bum. It's not the traditional steam bun I'm used to, which can be called many different names depending on the culture. 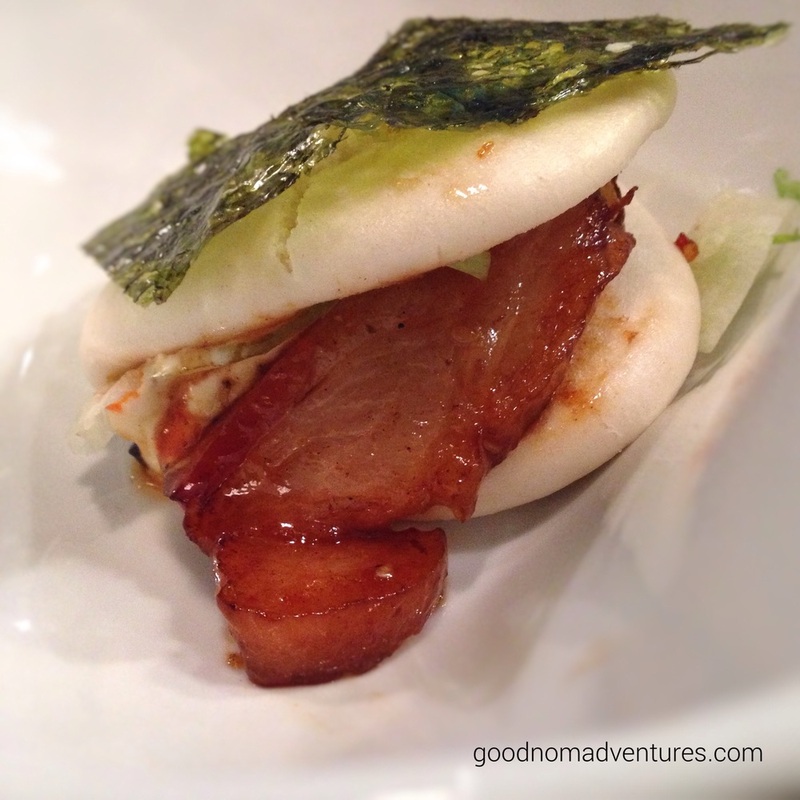 I grew up with siopao (pronounced see-o-pow) and I love eating these steam buns. These days the steam bun has been sort of deconstructed since you can see the filling and there's much more filling compared to dough. I loved this fresh bacon bun made with surgar-cured (you read that right! ), smoked, roasted pork belly. This was heaven in one itty bitty bite: sweet and salty and, of course, porky. Last, but not least, I also enjoyed the Grown-Up Soda they served. Had the original cola even though I really wanted the blackberry, but they were sold out. It was refreshing and delicious. I don't drink sodas very often, but I will have a soda made with real sugar every once in a while. I will have this again, maybe Blackberry next time. Overall, Noodlecat serves fairly decent ramen in Cleveland. They have another location in Ohio City and I don't think there are any other ramen noodle houses in Cleveland. Let me know of any and I will put on the bucket list. The reviews were hit or miss so I wasn't sure what to expect, but I think that can depend on your expectations about ramen noodles. I know that may sound strange, but all you ramen connoisseurs out there know what I'm talking about. Noodlecat will satisfy my ramen craving whenever I'm in Cleveland.